Story: When Lars Lindstrom (Ryan Gosling) introduces his brother Gus (Paul Schneider) and sister-in-law Karin (Emily Mortimer) to his new friend Bianca, who he met on the internet, their immediate response is shock and disbelief. 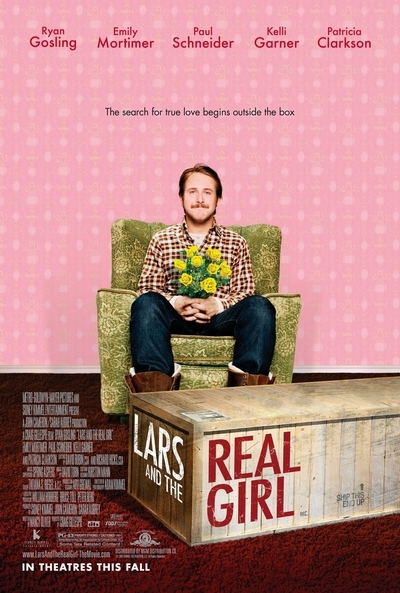 Has Lars, the sweet, socially challenged introvert gone completely mad - they meet Bianca and see a doll, but Lars sees a friend. Bianca isn't a real woman at all but a Real Doll, how will they explain this to the residents of the sleepy Midwestern town they've grown up in and currently reside? Karin and Gus consult the town's family physician, Dr. Dagmar Berman (Patricia Clarkson), who advises them to go along with it. Lars is experiencing a delusion and in order to help him through this crisis, they and the townsfolk need to get onboard. After some persuasion and appeal to their love and concern for Lars, Gus and Karin enlist their cooperation. Soon Bianca is attending church, modeling at the local dress shop, volunteering at the hospital and accompanying Lars to his first ever social events. Surprisingly to those around her, Bianca weaves her way into the hearts of everyone she meets, filling voids they didn't know they had. What follows is an emotional, comical, transformative journey for Lars and the people around him.